I had something in particular I wanted to try my hand at sewing — a juice pouch purse. For the last couple years, I have caught glimpses of these adorable little handbags being toted at the mall, pool, church and on vacation by everyone from little girls, to teens to grown women. I always thought how ingenious it was to create something that’s not only cute, but functional, not to mention made out of something that would normally be headed to the landfill. 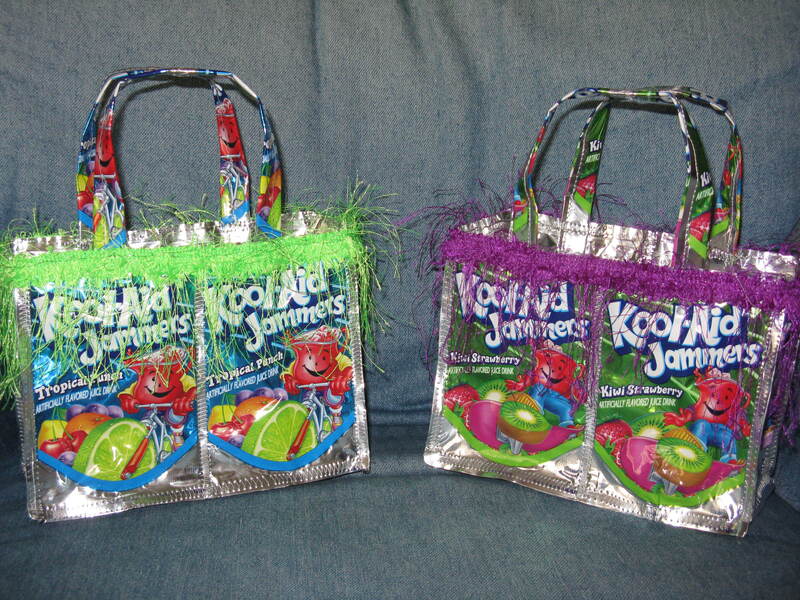 On a whim, I did a search for juice pouch purses on the Internet and found them for sale, ranging in price from $10 all the way up to $26. Being the frugal mom that I am, I decided I would try making my daughter a juice pouch purse rather than fork out the cash to buy one. How hard could it be? One friend donated her empty juice pouches from her daughter’s birthday party while another friend, who happens to be a superb seamstress, helped me with the sewing. Using free instructions and a zigzag stitch, we sewed juice pouches headed for the landfill into two adorable purses — within two hours time. We added a little trim later for some extra pizazz. Click here for the instructions we used to sew our juice pouch purses. These instructions include photos and are the simplest ones on the Internet that I could find. On my unofficial craft meter, I would rank these a 5 on a scale of 1 to 10. You do need a sewing machine and some basic sewing skills. To be honest, I did need a little bit of hand-holding from my seamstress friend, but now that I’ve made one I think I could go solo. And if I make a mistake, I’m only out a juice pouch or two. My daughter loves her new purse and we can’t wait to fill the second one with a few freebies fit for a preteen and give it as a birthday gift. I love it when I can save money, make a one-of-kind gift and do my small part to help save the planet from drowning in trash. I would love to hear from any of you who have made or received anything that recycles while also saving money. Leave a comment and I’ll update the post with your ideas.